Although the presentation of the budget is significant in Dominica's social and political landscape that annual event is usually unfailingly disappointing- like rotten balloons we carelessly inflate that blow up in our faces before they are half filled with air. But we hope that Government's budget for the 2016- 2017 fiscal year will be different for a number of reasons. Firstly, this year's budget will be the Roosevelt Skerrit administration's first budget presentation since the devastation of Tropical Storm Erika on 27 August 2015. Recall that after Erika Prime Minister Skerrit announced that he was putting on hold all projects and programmes outlined in the 2015-2016 budget that were not urgently required as he concentrated on the rehabilitation process. He said he needed to redirect resources to areas most badly affected by the storm. One of the programmes that was foolishly scraped was the income-generating World Creole Music Festival. Many people believed that the Ministry of Finance made the wrong decision and hence we are now witnessing this all-out effort by the organisers in 2016 to recapture the momentum, to bring back the regulars to the WCMF. Now that the country has recovered somewhat from the trauma of TS Erika we expect Prime Minister Skerrit to announce not only that he is reinstating the programmes that he cancelled in 2015 but also we hope that he indicates to the nation that there is a plan to move Dominica from crisis to recovery. We have noted that since that storm our government has not offered the nation a comprehensive plan or strategy to correct the damage that Erika caused, not only to the roads and bridges, but also to the economy in general. Yes, we have heard of the signing of many contracts to repair roads and bridges tou par tou but there has been no indication from the government of budget allocations, the setting of priorities and the determination of time-lines for getting the economy moving again. In fact Dominicans do not know the level of aid, in the form of grants and loans that their country received from friendly nations and institutions after Erika. If Prime Minister Skerrit knows we hope he clarifies these issues when he presents the country's budget within the next month. We also hope the Prime Minister, as he prepares the 2016-2017 budget, has noticed that businesses of all shapes and sizes are experiencing their toughest times ever; tourism is seriously challenged as hotels buckle under extremely low occupancy rates while banks threaten foreclosures; farming, in the best of times forever struggling with the twin demons of inadequate production and low productivity, is now being brought to its knees by a poor market structure and the deadly Black Sigatoka and other exotic diseases and pests; cruise ship calls and visitors are down. That's the reality of Dominica's economy as the country prepares to present its 2016-2017 budget. So let us cool down the spin machinery of the Government that continues to urge citizens to see the brighter side and to argue that there are so many positive things happening in the country that those who claim "gason, bagai mové" are just being blatantly unpatriotic, as if calling a spade a spade is some form of treason. It should be absolutely clear to everyone that we cannot move forward, if we continuously say "bagai bon", if we do not confront reality when the facts point to the contrary. Over the past decade the government of Dominica has blatantly painted false pictures of Dominica's economy while other countries confess that they are buckling under the weight of the world-wide economic crisis. Prime Ministers of other countries warn their citizens that the economic crisis had moved into a dangerous stage and have equated the situation to a national security crisis. 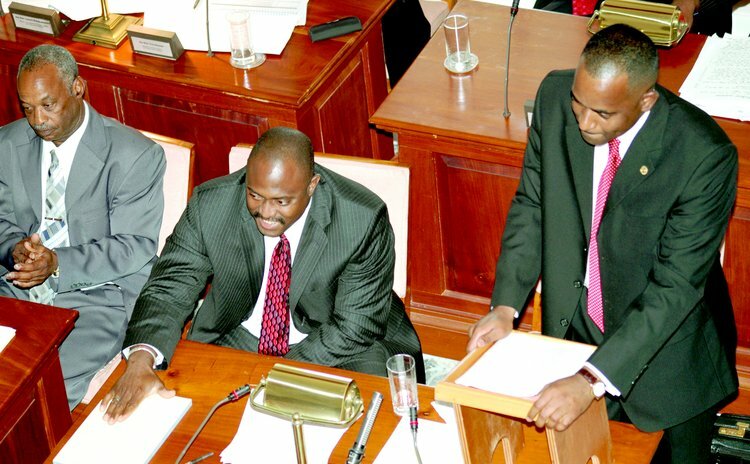 At the same time Prime Minister Roosevelt Skerrit was saying to parliament in one of his budget addresses that: "We are very confident, on the basis of reasonableness and logic, that there would have been a significant downward movement in both poverty and unemployment. This is clear from the continuing increase in economic activity and growth, despite the global crisis, and in the number of projects being executed all over the island". We hope the Prime Minister tells us things are bad, bad, very bad. And then he should show us how we are going to fix it together- all of us, red, blue, yellow and green. But no longer can we deny the depth of the country's economic crisis; government has to tell its citizens the truth. If the thing is not broken why should we bother to fix it? We are firmly of the view that Prime Minister Skerrit must begin to aggressively address the state of the economy and suggest specific, measurable, short and medium term goals for both public and private sectors. That plan must include some bitter cost-cutting medicine that the public will have to endure if we are to turn the economy around. Otherwise the International Monetary Fund (IMF) will undoubtedly step forward and it will demand uncomfortable doses of austerity measures, as it did to the Pierre Charles administration more than a decade ago. Undoubtedly, we are in a serious economic crisis and we need our government to lead us to recovery starting with the 2016- 2017 budget.